The temple is situated in a village called arattupuzha 16 km away from Vadakumnathan on the out skirts of Thrissur - Irinjalakuda route. The deity is "Dharmasastha" and there is no sub shrine. "Vasishta" the "Devaguru" is worshipped here according to other legend. 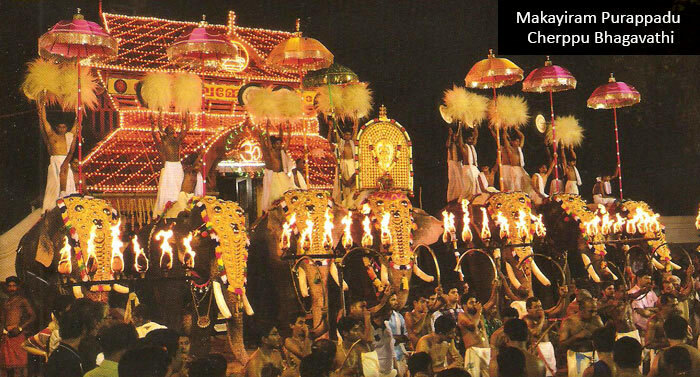 Arattupuzha Pooram is conducted in a classic style during march - April. 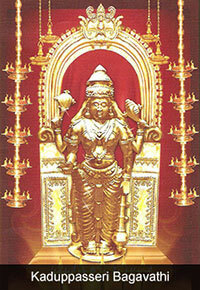 There were 108 participating poorams in this festival and all temples in kerala will close before sunset on this day to attend this "devamela". 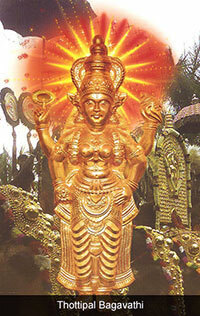 Due to various reasons most of the participant pooram absconded from this festival and now the toll is 24. 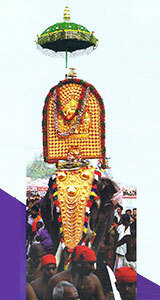 The host is "arattupuzha sastha" but the presiding deity of the "Deva sangamam" is the "Thrippayar Thevar"
The evening starts with the host "arattupuzha sasta" pooram with 15 elephants and panchari melam. Staring at 6.45pm and covering all 5 kalams meticulously finishes at 10.50pm. 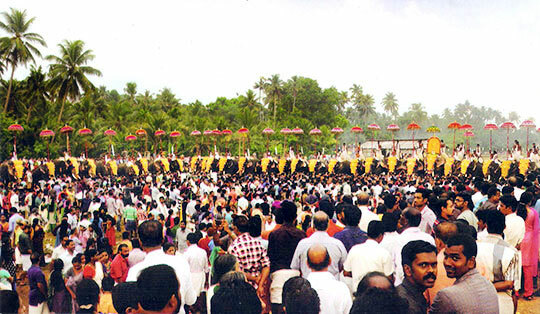 After the melam Arattupuzha sasta waits in "Nilapaduthara" for other pooram to enter. Mean while "Chathakudam sasta" along with "thottippal bhagavathi" with "panchari" will enter. Arattupuzha sasta will hand over the charge of host to Chathakudam sasta and leave. 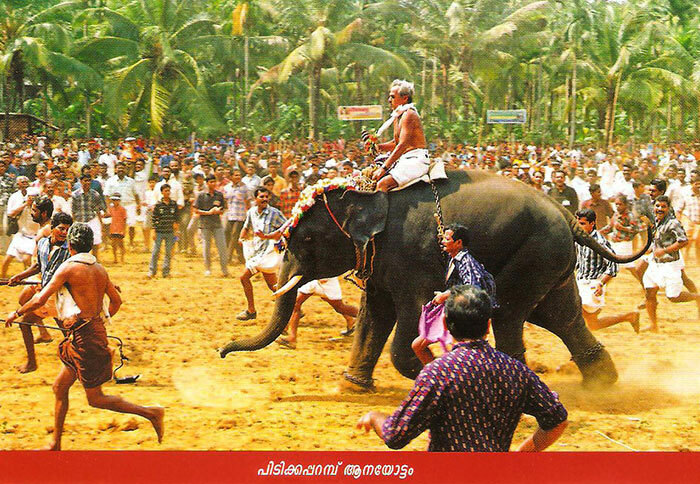 The various pooram will enter the field. By midnight when star "choti" surfaces the arattu starts with "pisharical bagavathy's" arattu in "mantharam kadavu", a special place for holy dip in the river. The anti tetanus pisharical bagavathy will clean the river and the sacred "ganga" will join the river at this moment. In the meantime the Trippayar Thevar will reach the boundary and starts with pancha vadyam. During course of travel the no. of elephants will increase and the melam will be pandy. The majestic journey through his own land and the dramatic entry in the wee hours is really royal. Thevar at center in a elevated "Nadavarambu" (foot path among paddy field) Cherpu bagavathy and oorakathamma thiruvady on both sides and others in either side facing the rising sun, is the panorama of this pooram. The view of these 70 odd caparisoned elephants, slowly marching towards the rising sun is an amazing view. 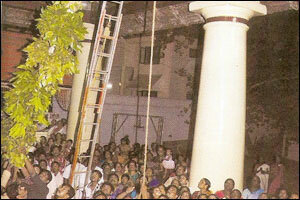 It is believed that 33core devathas of Hindu mythology will be watching this greatest show on earth. 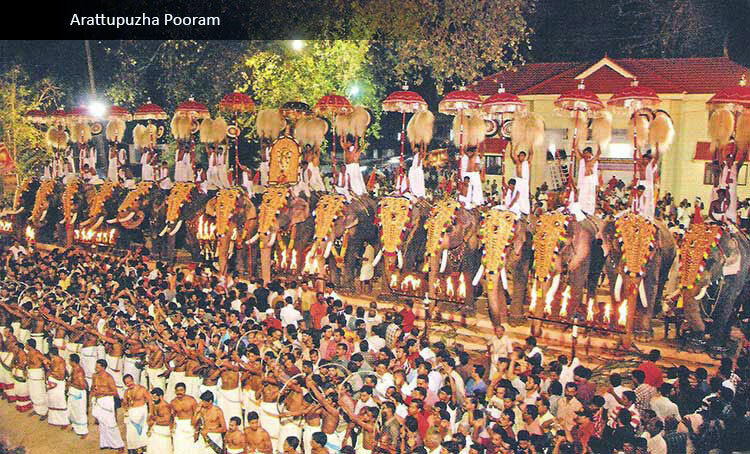 It's the "Arattu" of famous "Peruvanam" pooram. 11.00pm. 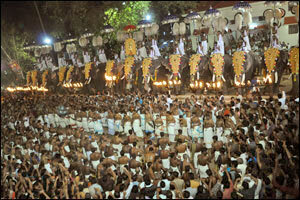 Nettissery Sastha with 5 elephants and Pandi Melam arrives from western side. On the ground. 12.00 Mid Night - Kodakara Poonilarkkavu, Chalakudi Pisharical, Kaduppassery - panchavadhyam. 12.05am. 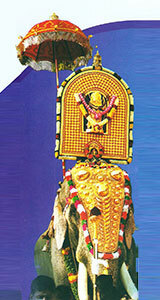 When Thevar reaches kaithavalappu the arrattu(holy dip) starts at "Mandaram kadavu". kadalassery Bhagavathy is privileged to start with. 12.05am. 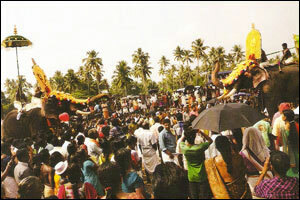 Trippayar Thevar arrives at Pallissery center with 11 elephants (starting point of Kaithavalappu) and Panchavadhyam starts. 5.30am. The "Kooti ehzhunnallippu" Thevar at center on nadavarambhu. On the right Cherpu Bhagavathy( goddess of Earth) and on the left along with Chathakudam Sastha, urakathamma ( Lakshmi Devi) All other percipients will join the row on both sides.